One of my regular clients came in. Normally she is pretty upbeat, even perky. But today, she seemed very tired. Her energy was dimmed and repressed. When I asked her she said that yes, she was indeed feeling tired, although she had no idea why. Shortly into our session, I noticed, slightly above her forehead, an energetic mass (for lack of a better word) that felt sort of gray and tangled, like a snarled up ball of gray yarn. About the third time I passed my hand over it, wondering what it was, she exclaimed: "I know what it is!" I described what I had been feeling, and she laughed, because it felt like a good description of it to her. She said she hadn't known why she had been feeling tired and low-energy, until I had "touched" the "gray ball of tangled yarn" energy over her forehead. Then she realized that something had been bothering her, an issue with a friend. She was feeling worry and unease because of something that wasn't right between them, something she (my client) needed to set right so that she felt in harmony with her own highest self again. It only rose to her conscious awareness after being "touched." Then she could see what it was — and it dispersed. After the session, she said she felt great. Her voice had its usual lilt, her color was normal, her energy had brightened and she seemed full of her normal vitality. This story illustrates the power of just being a witness for another person. I didn't DO anything with the tangled, gray energy. I just noticed it, wondered about it. And that was enough for HER to disperse it. 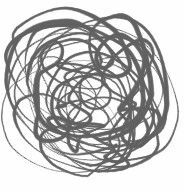 The Principle of "Least Done, Best Done"
The story of the "tangled gray ball of worry" also illustrates the principle of "Least done, best done." Remembering that people always heal themselves, our job as energy healers is mainly to provide our clients with a container for healing, to witness, to hold them in unconditional positive regard, to empower them to access their own wisdom and to do the least intervention possible to set their own self-healing in motion. This is best for the client, and best for the healer as well. If you enjoyed this story, you may also enjoy this page on The Energy Healing Site: The Healing Power of Presence.